Earlier this month I had the pleasure of joining a Taste Alberta tour featuring one of their industry partners – Egg Farmers of Alberta. Our tour took us to Morinville Colony, a Hutterite colony north of Edmonton, where Paul Wurz showed us around the colony’s 20,000 hen laying barn. While most eggs in our province would get transported from a farm to a grading facility, Morinville Colony is one of the few egg operations with its own grading facility, monitored by the Canadian Food Inspection Agency, allowing the colony to sell directly to restaurants, stores, at markets, and to consumers who show up at the farm. After suiting up – we were able to enter the grading station, where we watched as eggs made their way along a conveyer belt to be washed, graded, packaged by weight, and loaded on to a truck for same day delivery to restaurants and stores in the Edmonton area. Past the grading station we entered into one of the barns which was home to 10,000 hens. It was quite comical looking at rows of hens poking their heads out from their cages as we walked towards them. I thought I would be turned off by the smell or the sight of hens in cages rather than running free, but instead, I was amazed by how clean the barn and hens appeared and the lack of a pungent barnyard odor. I have to admit, my knowledge of egg farming in Alberta was limited to farms I have been to where a family collects eggs for their personal use on the farm. I was surprised by the efficiency of a big-barn operation like Morinville Colony – just three men manage the bar and get 20,000 eggs graded and packed each day. I has assumed that free-range eggs were a superior product, but my tour showed me how many regulations big barns must follow – including how a daily record of the hens’ feed, water, barn temperature and any problems must all be accurately recorded. I got to see first hand how farms like Morinville Colony are producing a high-quality product while complying to strict animal welfare standards. Here are 9 things I learned on my Taste Alberta – Egg Farmers of Alberta – Morinville Colony Tour! Each year in Alberta, over half a million eggs are produced by over 2,000,000 hens by over 160 registered egg farmers in Alberta. On more than one occasion I’ve heard that brown eggs are healthier. Well – unlike the difference between brown and white bread, the egg shell has nothing to do with the nutritional content of an egg. The breed of chicken determines the shell colour and in the words of Paul after I asked him about this old wive’s tale – you don’t eat the shell! Eggs available at grocery stores across the province are fresh, and almost all of them are from local egg farmers right here in Alberta. Most eggs typically arrive at the grocery store within about a week of the time they are laid on farm, stopping only briefly at the grading station before hitting the grocery store shelves. 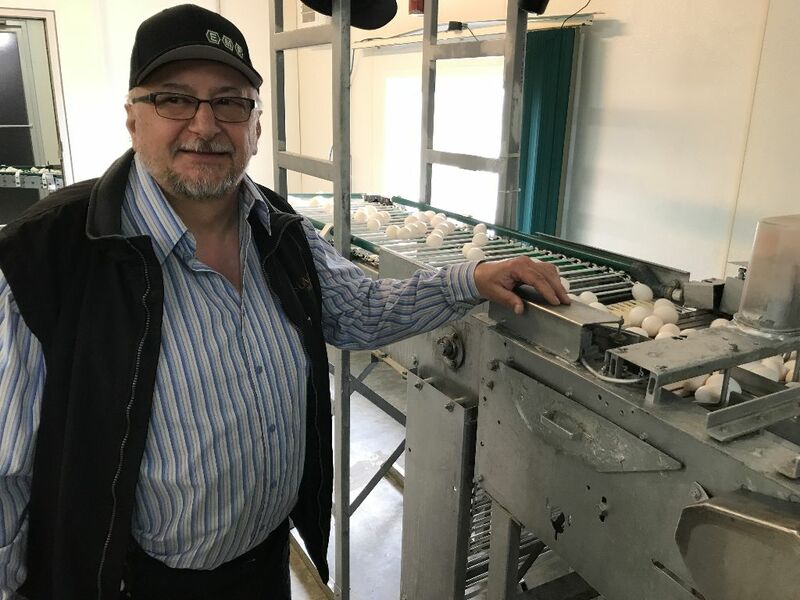 Since Morinville Colony grades their own eggs and ship directly to places like the Italian Centre, the ones on the shelves there could be less than 24 hours old. I’ve always believed that the darker the yolk, the healthier the egg, while others on the tour thought paler yolks were better. Paul explained how they feed their chickens a diet of wheat, barley, soya, and vitamins and minerals – and that by introducing corn, alfalfa, grass or some flax, he could change the colour of the yolks all 20,000 hens in the barns to a dark yellow. In approximately two hours, 20,000 eggs are graded by one of the men who work in the barn. After being washed, egg quality is examined using ‘candling’, which is a process that passes the egg over a bright light to make its interior visible. The grader checks the shell quality and size of the air cell, and confirms that the yolk is well centered. Grade A eggs have a clean and uncracked shell, a round and centered yolk, a firm white, and a small air cell. At the colony, any egg that doesn’t make the grade is still used on site for cooking and baking. At Morinville Colony the cages are set up so that the hens are never standing in their own poop (a design that also helps prevent the eggs from ever touching poop or getting pecked at by the hens). In the Morinville Colony laying barn all chicken poop drops onto a conveyer belt. It is then removed from the barn and collected so it can be spread on the fields as fertilizer for the grains that are grown on the farm to be fed back to the chickens. Supply management is a uniquely Canadian system under which farmers work together to match what they produce [supply] to what consumers want [demand]. Canada’s egg farmers agree to sell their products under a consistent set of rules, thereby balancing supply and demand. Albertans are eating more eggs than are currently produced by Egg Farmers in Alberta – so shortages come mainly from the other western provinces. 9. Why wash an egg? Eggs are washed and sanitized in water of regulated temperature and acidic balance. Washing removes dirt and any bacteria adhering to the shell. While eggs are usually clean when laid, they can sometimes be contaminated with Salmonella or other bacteria that can cause food poisoning, even if they look clean. Paul sent us home with a carton of Morinville Colony farm fresh eggs – which I used to make a batch of devilled eggs. Check out a Basic Devilled Eggs recipe, and many more recipes, available on Egg Producers of Alberta’s website. I’d like to thank Taste Alberta, the Egg Farmers of Alberta, and Morinville Colony for a great tour. I left with a new confidence in buying store-bought cage-laid eggs – I love any opportunity to know where my food comes from. Check out the Egg Farmers of Alberta website for information on the egg industry, egg farming, videos and even egg-barn camera feeds.